ZOMBIELAND is no classic comedy like SHAUN OF THE DEAD (which it emulates in small snatches), but it still gives veteran zombie auteur George A. Romero a lesson in how to insert all that “black humor” and “satire” that he never puts into his movies yet that he is famous for. Directed by video nobody Ruben Fleischer (written by Rhett Reese and Paul Wernick), ZOMBIELAND also addresses a deeper theme that Romero could never envision: that of its characters running FROM zombies but running ever towards the past that they lost; the “innocent” time before Zombieland. Surface story follows four people with guns that never run of bullets, traveling across country while trying to remain un-undead. Guns, guts and gore, hero shots, geek-gets-girl, blood-spattered undead end to end. ‘Nuff said for most rednecks, and a subtle character study for normal-colored necks. Woody Harrelson brings his NATURAL BORN KILLERS, as laconic cowboy loner, Tallahassee, who picks up Jesse Eisenberg as Columbus (doing such a good Michael Cera homage, I feel like beating him up for his lunch money); Emma Stone wearing enough mascara to embarrass a prostitute dressed as Jack Sparrow; and Abigail Breslin growing up onscreen in front of our eyes. Once again, the “realistic” reason behind the zombie epidemic is updated. In the ’50s and ’60s – radiation; the ’80s and ’90s – genetics; 2000s – now a virus, spawned from mad cow disease. 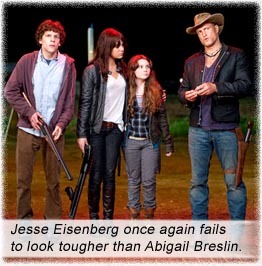 Starring: Woody Harrelson, Jesse Eisenberg, Emma Stone, Abigail Breslin, Bill Murray, Amber Heard.